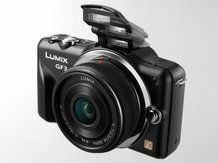 In our latest look at some of the new digital cameras tipped for release in 2011, we turn our attention to the Panasonic Lumix GX1/GF7/GF8/GFPro model which will be a more advanced version of Panasonic's GF range. Panasonic's director of its DSC Business unit Ichiro Kitao confirmed to TechRadar in June that the company had plans to split the GF series into two lines and release a GF camera aimed at experienced photographers. We're not quite sure what the new camera will be called, with some reports suggesting the GF7 is the most possible name, more recently43 rumors has been reproting that it will be the GX1. Others touted have been the GF8, along with the GFPro.